Guest Blog with Ginny Merritt | Lift Jesus' Cross! Posted on October 17, 2011	by Lift the Cross of Jesus! Along the Erie Canal in central New York is a town called Clyde. My husband and I have a fix-it-up-house there. On a recent work-visit, I asked my son to remind me how to get to a nearby canal park. Well, I had obviously missed it, but he had piqued my interest. That evening after dinner, I hopped on my old blue Schwinn and pedaled a couple of miles over the canal bridge, out-of-town, past farms and fields. 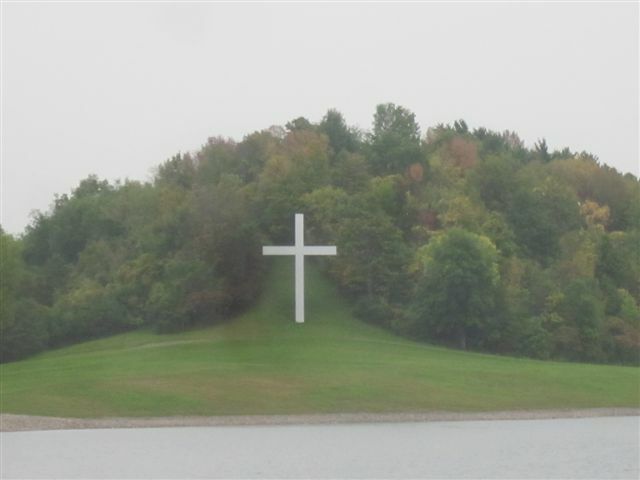 At a bend in the road more than two miles out, I saw the cross, nestled on a small hill against a grove of pines. Huge, white, imposing. Just as my son had said–I couldn’t miss it. You couldn't miss it. Huge, white, imposing . . . just like my son said. near the end of a Dead-End road, straddled my bike and looked at the reflection in the water. A grassy bank sloped up from the far side of the pond. The cross stood silently, white arms outstretched, against dark green. I wondered why it was there. Whose property was this? Who had erected it? Why? The questions went unanswered that evening, as dusk was setting in and I had three miles to pedal back home. members of a family for their faith in Jesus Christ and their lives lived out in light of that faith. 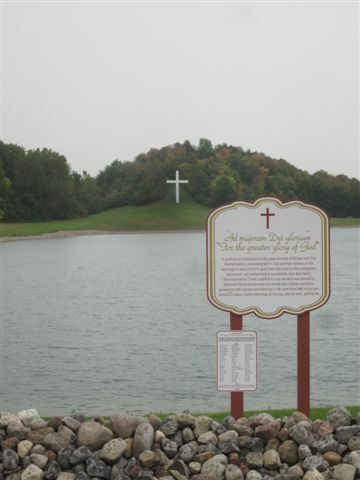 I was humbled by this testimony marked by the huge white cross. Faith interwoven with works. Ginny Merritt is a sawed-off hippie homemaker, writer, photographer and pastor’s wife living in New York with her husband Ray. They have two grown children and two growing grandsons. They all love to garden with specialties ranging from Brussels sprouts to morning glories. What a wonderful testimony erected by this family! Thanks for sharing, Ginny.